Once Upon A Time In Mumbai Dobaara (2013) Hit or Flop : Box Office Collections - Checkout Box Office Verdict, Trailers, songs, lyrics, release date and collections of Akshay Kumar, Imran Khan, Sonakshi Sinha starrer Once Upon A Time In Mumbai Dobaara. 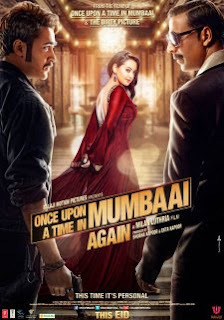 The movie is directed by Milan Luthria. It released in India on 15 August, 2013.